Ditch your favourite sugar-loaded beverage, and step into the healthier world of body-enriching flavours of fruit-infused water. Apart from being easy to prepare, your body will thank you for the hydration and vitamins it’ll get from these healthy concoction. So if you haven’t jumped into the fruity-water bandwagon yet, here’s a list of its amazing health benefits that’ll surely make you want to get on board. 1. Healthy Hydration. We know that the body needs about eight glasses of water a day, which is quite a discouraging task as water is tasteless and boring. 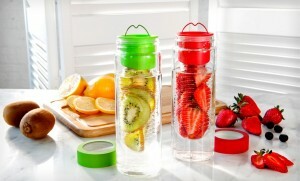 For an effortless solution for your daily dose of fluid, fruit-infused water is the way to go. The fun and fruity flavours will make you forget you’re drinking water. 2. Energizing Nutrients. Unlike the energy provided by caffeinated drinks, this concoction provides long-lasting vigour that’s filled with minerals and vitamins necessary to keep you healthy. So why settle with caloric cups of Joe when a pitcher of calorie-free fruit-infused water makes for a better revitalizing solution? 3. Antioxidants for Better Health. Apart from the vitamins and minerals, this miracle concoction also offers antioxidants that help boost the immune system and fight bad bacteria. It’s time-wasting to get sick these days, so here’s a simple and easy way to prevent that from happening. 4. Weight Loss and Craving Control. 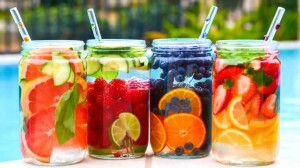 Fruit-infused water has the ability to flush out all the unwanted toxins from your body, while satisfying your sweet tooth with its natural sweetness from your favourite fruit. A lot of people actually claim that they’ve been enjoying drinking fruit water as it helps satiates cravings, minus the guilt feeling. 5. Fairer Skin. The key to getting fairer skin is to cleanse your body inside out. Creams and facial washes will only do so much if you continue polluting your body with sugars and preservatives. So start ditching the soda now and drink a pitcher of cucumber-lemon-mint water a day instead. This concoction can do wonders for the skin – maintaining the skin’s clarity and making it plumper and suppler. If you’re struggling with dry skin, frequent intake of fruit-infused water is a good skincare practice. Water is something that you really can’t drink too much of. 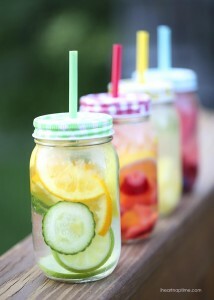 So if you want to up your water intake, try incorporating some of your favourite fruits into your drink. Not only is it a good way to lower your sugar ingestion, it’s also a good way to start a path towards a healthier lifestyle.